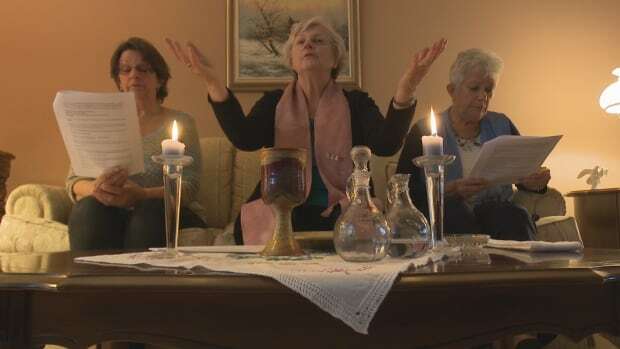 The curtains are drawn as Marie Bouclin transforms the wooden coffee table in her modest living room in Sudbury, Ont., into an altar, lighting candles and filling a chalice with red wine. 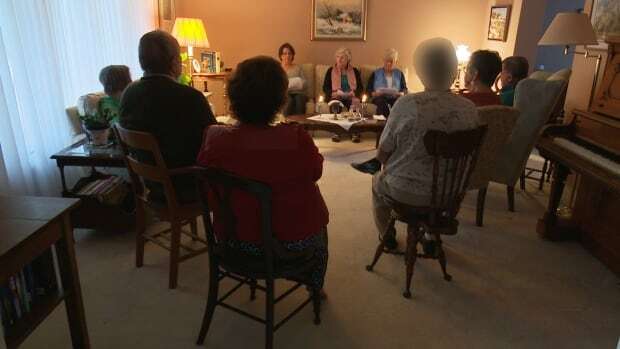 A dozen of her parishioners sit in a semicircle around her. One woman is so worried she might be identified, she asks CBC to blur her face in any photos. 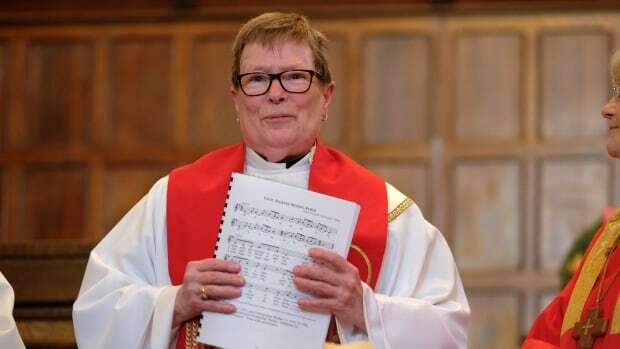 Bouclin, one of only two Canadian bishops in a small movement of Roman Catholic women being ordained outside the official Church, leads the room in a service that goes against 2,000 years of Catholic tradition and doctrine. 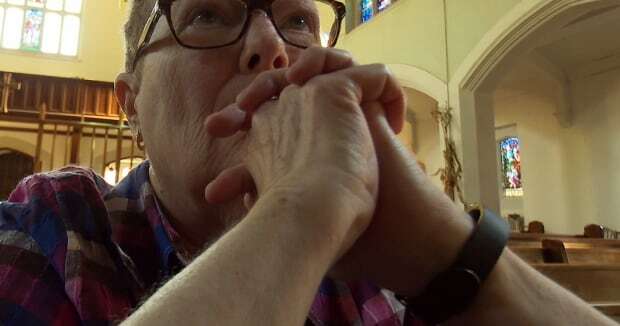 Bouclin, 75, became a nun when she was 18, but after seven years, she decided to leave the convent to get married and raise three children. She obtained a Master’s degree in theology from the University of Sherbrooke, focusing on the study of women who had been abused by clergy. That led Bouclin to begin working with an organization called Women’s Ordination Worldwide. 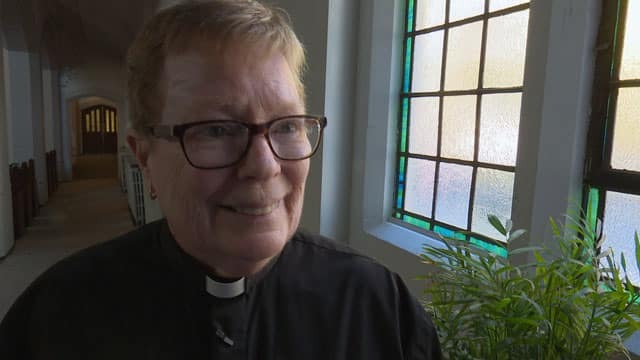 In 2007, she became a priest herself, and in 2011, she was elected by the other priests in the women’s ordination movement in Canada to serve as their bishop. Bouclin is a self-described heretic. Bouclin says she believes the Roman Catholic Church is sexist. When women in the movement get ordained, they are automatically excommunicated by the Vatican. Still, Bouclin insists she loves the Catholic Church, as do many of her parishioners. Anita Corriveau, 70, drives almost four hours from Sault Ste. Marie, Ont., to Sudbury to pray with Bouclin. 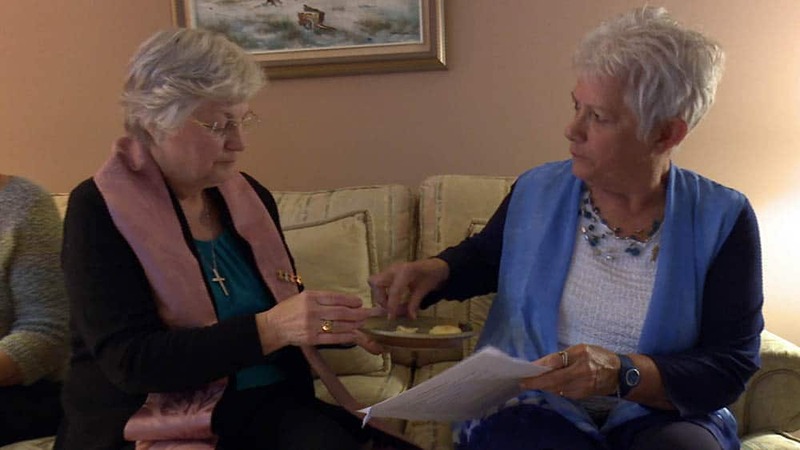 The female priest movement began in Germany in 2002 when a bishop in good standing with the Catholic Church, referred to within the movement as “Bishop X,” ordained seven women in secret. Having a bishop within the Church perform the ordinations, members of the movement argue, allowed the apostolic succession — the line of bishops stretching back to the time of the apostles — to be preserved. Bouclin says there are now 182 female priests and 16 bishops in 14 countries across the globe. Canada has 15 women who belong to the movement. As one of a small number of bishops, it’s Bouclin’s mission to help find suitable candidates and ordain them. Pat Cook, 70, is one such candidate. Bouclin met her at the ordination of another woman in 2015. Cook, a retired teacher, says she was exhilarated by the ceremony and soon after began her own journey. She insists that if the priesthood had been an option when she was young, she would have chosen it. Cook admits to being nervous about her ordination, but mostly, she says, she wants to get it over with so she can help the people in her Toronto community. A recent New York Times/CBS poll reported that 64 per cent of Catholics in the United States support women’s ordination. Meanwhile, the Vatican remains opposed to the idea, saying that the ordination of any woman is invalid. At a press conference in November, Pope Francis reiterated the church’s long-held position and hinted that women will never become priests in the Roman Catholic Church. Rev. Thomas Rosica is the English-Language press attaché for the Holy See. He admits it can be a challenge for the Church to explain why women can’t be ordained. “We live in a society where people expect much for the language of equality,” he says. Rosica stressed that there are many ways that women can contribute to the Church without becoming priests. Mid-afternoon on a warm Sunday in November, Cook walks nervously down the centre aisle of a United Church in Toronto that has agreed to host her ordination. There are about 50 people in attendance, including several members of Cook’s family. When Bouclin steps up to the podium to officiate the ordination, she can’t resist mixing politics with religion. Bouclin says she doesn’t care if some Catholics dismiss her and the women she ordains. Bouclin invites Cook to sit in a chair in front of the altar and lays her hands on Cook’s head. “I ask you, ‘Are you ready to be ordained for priestly ministry in the Church by the laying on of our hands and the gift of the Holy Spirit? '” Bouclin asks. Cook quietly states that she is.